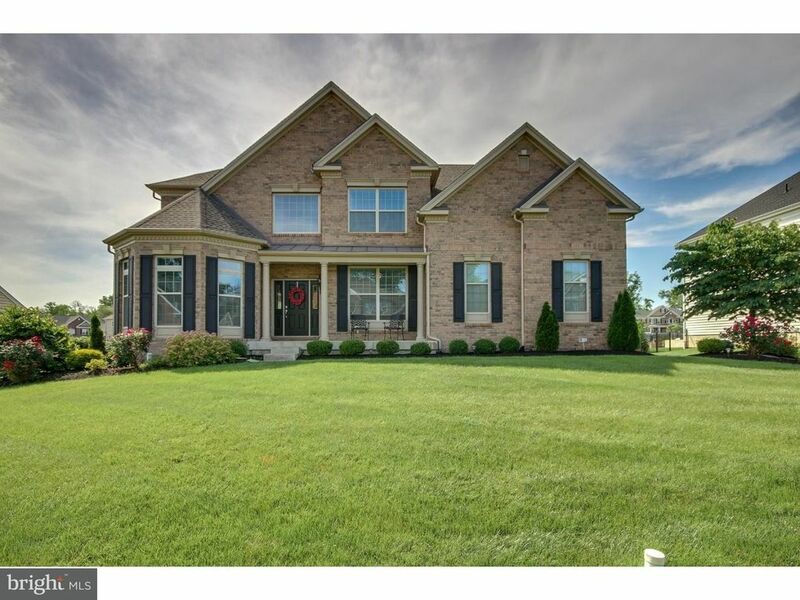 Toll Brothers Warrington Glen Lexington Model with Full Brick Front, Features Covered Front Porch which Leads to Dramatic Two-Story Entry Foyer with Open Oak turned stair case.Open 1st Floor plan concept.Gorgeous Espresso Oak hardwood floors throughout Foyer, Library, LR, DR & Kitchen. First floor, Double door Office/5th Bedroom w/ full bath off foyer.Spacious Foyer opens to gorgeous Library/sitting room with 4' Extension and Alcove of Windows & Accent Columns and Elegant upgraded crown molding and Custom mill work continues into the formal Living room with custom crown molding, custom wainscoting, recessed lighting and accent columns which opens into the dining room with raised ceiling, custom wainscoting and crown molding.Upgraded kitchen features 42 extended cabinetry with Custom Antique glazed finish sold cabinetry with soft close doors and maple boxes, modern pennant lighting, custom recessed lighting, Gleaming granite counter-tops and center island with seating for 4.Kitchen also features upgraded stainless steel appliances and a walk-in pantry. There is a separate eating area with custom Pella Slider to a newly installed, Custom Composite Decking with PVC Rails and views of the most desirable deep lot in the entire community. The Kitchen opens to a magnificent great room with a two-story soaring ceiling, Beautiful custom gas-fired stone fireplace and bay window complete the family room. Convenient back staircase off family room provides quick access to the bedrooms upstairs. Large open 2nd floor landing leads to the master suite, which boasts a deep tray ceiling, ceiling fan and spacious sitting area, and a large walk-in closet. The master bath is adorned with French doors and exudes a luxurious Master Bath with soaking tub, raised ceiling, double vanity, Separate double door shower w/ custom ceramic tile. Three additional bedrooms are all nicely sized.Each bedroom offers double closets with raised panel by-pass doors & Ceiling fan. Beautiful hall bath with ceramic tile floor, double vanity and tub/shower combination with ceramic tile surround. This beautiful home sits on a Level and open backyard with plenty of room to run and play and is easy to maintain. The 9' basement is roughed in for a full bath and is ready for finishing touches.The entire interior of the home has been professionally repainted and is practically brand new and ready to welcome you home. Call today to schedule your private tour.